Report: Verizon takes the crown as the fastest wireless network in the U.S.
PCMag just announced the results of its fifth annual test to see which mobile carrier has the fastest network in the states. The winner? Verizon Wireless. According to the test, Big Red offers the fastest, most reliable network, with the widest coverage. And just to show that T-Mobile CEO John Legere isn't just a promotional genius, the mobile operator finished on top in half the cities tested. Of course, Legere just might have CTO Neville Ray to thank for that. The testing also showed that besides Verizon and AT&T, T-Mobile has done an impressive job getting up to speed with an LTE network that seemed to come out of nowhere. Sprint, on the other hand, continues to disrupt coverage in order to gets its LTE pipeline completed. 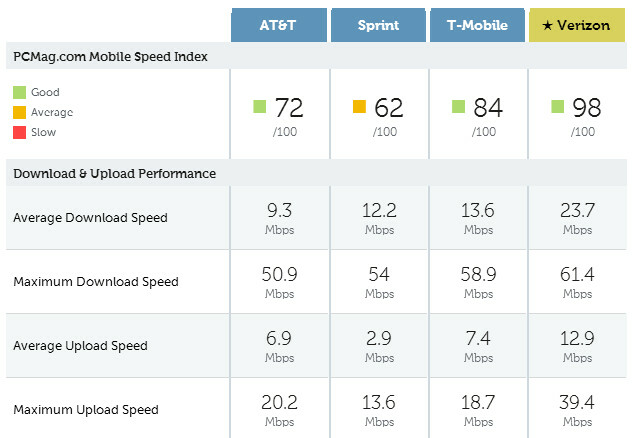 Speaking of speed, many believe that Sprint will eventually be the speed king in the U.S. While AT&T won the crown last year, this year it was Verizon's new XLTE service that took the carrier over the top. The service runs LTE over Verizon's AWS 1700MHz spectrum. In combination with the operator's 700MHz spectrum, the nation's largest carrier offers strong service in rural markets, while XLTE helps those in major cities where networks are often too congested. The LG G2 was used for the drive tests because the device is available for all four major networks. The drive tests covered 30 cities and thousands of miles, and were supplemented by surveys from individuals who turned in their own experiences. One that is not available to probably a majority of VZW users…. These speed tests are a moving target. One year, ATT is on top, next year, it is VZW. In one more year, it could be T-Mo or Sprint. The real test is who is consistently (year-over-year) fastest. VZW had an advantage when it was the only option for a wide footprint LTE presence. Now that everyone else is claiming similar coverage, separating out truth from fairy tales is a bit of a challenge. The whole thing could be totally bogus. I have friends on all networks, and Verizon users are the most data timid users of all. My friend actually was an hour late meeting at a ski resort, because he was near his data limit, and did not want to use his GPS. And, it is not just that, data caps are costing me money. I must have heard data cap excuses 40 times in the past year. Next time... They are fired. I hope states incur legislation that prevents Verizon and AT&T from such huge markups on data overages. I imagine the overage markups are 1,000%. It would be like gas costing $150/gallon after you use 100 gallons in a month. At the very least, they should be subject to windfall taxes. "and Verizon users are the most data timid users of all" - Its easy to go over 2gb of data on Verizon because you get LTE EVERYWHERE!!! "I hope states incur legislation that prevents Verizon and AT&T from such huge markups on data overages. I imagine the overage markups are 1,000%. It would be like gas costing $150/gallon after you use 100 gallons in a month. At the very least, they should be subject to windfall taxes." Yea but imagine that eveyrone was going to the SAME gas station to get gas in the city (much like towers are to data) So if everyone used all the data they wanted, and you only had lets say 10,000,000 of gas a month for everyone in the city, each citizen would be rationed to 100 gallons a month and they would be charged more (a premium markup) for using MORE of the data in the available pool. Another example is a toll road. You pay tolls on a road because tolls 1. Limit the number of cars that can drive on a certain road, pretty much esuring zero traffic. 2. Pays for the maintence of the road so you always get a non-bumpy surface, no pot holes, all the markings are mantained. Well a digital data network is the same thing. Verizon charges premium for its data rates, but with a good sense - there's signal everywhere, its fast for everyone, it never buffers, its not overcrowded. Yes, you have a crazy a$$ sweet deal but, it don't beat my Unlimited Data for $23.99 (after corporate discount) and $29.74 for my minimum Voice Nationwide 300 Plan; I know I only have 300 minutes but my Groove IP app kicks in with a cool California number and free texting also courtesy of Groove IP (and, Google Voice and WhatsApp, of course). Besides, who really does voice calling anymore; that's soooo 2003. Have to give it to Big Red, I got an S4 to try out this XLTE for my PAPISELF and it IS twice ia fast as regular LTE. I just have to say to all you Sprint subscribers, "you has my deepest SYMPATHY but, you know what they say, you get (or in this case barely get) what you pay for. And, you pay for crappy voice service, abysmal data speeds and horrific Customer disService. But, enjoy your cheap a$$ bill." I use minutes because of voice conferences and calling other stores and what not... So I need the unlimited minutes, I can't always text my boss sometimes I need an immediate response and calling is the only way to go when you need an answer that second... and that douche has two lines and sometiems doesn't answer! xD. I know I don't have 'unlimited' data but you're paying almost the same as me and I have a hard time even using 8gb... So its pretty similar deal. If I ever were to get close to passing 8gb, Ill just bump my plan to 10 or 12 that month. Problem solved. You must not understand business. When you offer service in parts of the US that many carriers don't cover people will pay what it needed. Business 101 is charge what people all willing to pay. Everyone has choices. You may view Verizon and AT&T expensive but for my AT&T is pretty inexpensive for the coverage I recieved. In fact AT&T is cheaper for me than all other carriers. I have 10GB Share plan. I use my phone lot but still have 3-4GB left at the end of every month. Other phones on my plan use less then 200MB on their iPhones. Peru, Indiana between Kokomo and South Bend...I hit this dead zone on my way to college and back. Go up to malibu in California and catalina island as of 2014 verizon lte is spotty. And u drop down to 3G evdo while att maintains strong lte in those same places so yeaaa your are lucky that in your area u havent dropped down to Verizon 3G because its painfully sloooow..
Verizon's 3G is slow, but definitely more usable than Sprint's. Yea, my area has Verizon 3G as well. And my dad's house, on Verizon maps, is shown as an LTE area with very good coverage. Guess what.. he doesn't get any whatsoever. No LTE, no 3G, not even 1x. No service. Verizon is NOT that much more expensive than you think. Remember you pay for what you get. Verizon has service in most areas & the new XLTE is just bonkers. 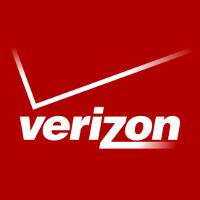 Verizon is the only company that delivers in quality, speed & reliability. No one else in the US can EVEN come close! I gladly pay Verizon what they ask because it's MONEY well spent. You will never get a Ferrari for the price of a Kia... Verizon is the Ferrari & the other less reliable, slower, & bad quality carriers are the Kia... There is a reason why other carriers are cheaper than Verizon. They CLEARLY don't offer what Verizon offers. Except a ferrari doesn't limit how much gas you can use or how many miles you can travel. Verizon's price would be acceptable if they had an unlimited data option. But at 2GB it isn't worth jack crap, no matter how "fast" it is or how good it's coverage is. If you're limited to how much you can use it, those 2 points become moot. I don't understand your autobahn analogy. Autobahn lets you go as fast as you want and as often as you want. Now a better analogy would be Verizon= 5 miles on the autobahn, after which you need to stop and wait a month before going another 5. Also the edge plan is nothing short of a scam. Add on between $20-30/month for each device you'll be paying off, as the average consumer and for those 4 users, $80-120 will be added onto their bill.. so $240-280/month. Compare that to the previous deal where you can have a minute/text plan and each user pays for data. I'll use my families example of 700 minutes with unlimited text for $80/month. Then add on $10 for each line, so if it's 4 lines, we are looking at $120 total. Now if each person adds 2GB (or unlimited if they joined up that far ago.. which is our case), that's $30/each extra. So $240 total, no more. BUT, here's where there's also a significant differences lie: subsidized phones (though of course you're on contract), and you don't HAVE to get a data plan. Have you seen Verizon's pricing for basic phones?? $30 line access fee!! My family has 5 lines with 3 of them being basic phones. Current cost= $80 (plan)+ $40 (4 extra lines.. line access fee)+ $60 (data plans for 2 devices, one of which is unlimited data).. this comes out to $180. If we were to go over to the new plan, it would be $100 (plan)+ $30 (edge discount 2 devices) + $90 (line access fee for 3 basic phones) for a total of $220 + $40-60 monthly for 2 devices, for a total of $260-280. $100/month more for the new plan.. no thanks. I'm in the exact same boat as you. If I were to change plans now, my bill would increase by 30 dollars, and my two unlimited plans which only average about 2-5 gb a month would then become capped at less than half that. Ummmmm, no, I'll pass. except that isn't the case. We aren't comparing Sprint to Verizon, but rather T-Mo to Verizon, so we are comparing 2 ferrari's, with one of them able to only go 5 miles on the Autobahn before waiting a month to go another 5 miles, while the other gets to go the whole distance unhindered. Now which sounds like the better deal? As an unlimited customer, I actually disagree. You don't need unlimited data. It just needs to be *reasonably capped*. 2 GB is far from reasonable at the same 30.00 dollar price as my unlimited is. Not to mention the chit 40.00 dollar line access fee. Seriously? No, 10.00, the same as it always was, would be reasonable. I might could even justify a 50% increase to 15.00. But 40.00, you have lost your gotdamn mind. I don't care how fast they "become" if they won't give me reasonable amounts of data to use. 5 gb was once considered "reasonable" on their unlimited plan, so it should be that for the 30.00 dollar tier of data. Then, I could reasonably see a 7-10 dollar per "extra" gb surcharge. If they bump me onto one of these plans then they will get to see how "fast" they lose me as a customer. I don't agree with people using their "unlimited" plans as a sole means of internet. IOW, the people that tether 500 gb a month are ridiculous, but this harming everyone with their asinine policies is just BS. XLTE without a lot of users is quite bonkers. I have seen ~56Mb/s down on my Droid Maxx. Put a bunch of users on the XLTE network and it can slow down to 3G speeds. Downtown Palo Alto, CA at mid-day during the week is a high usage time, and I have seen ~1.1 Mb/s down. High peaks and low valleys. PA slow to report news as always. Look at T-Mobile's 3G making Sprint's LTE look bad lol.